When your pup is looking out the window, can you sense that there is some sort of longing in his eyes? Not just the longing to chase after that squirrel running up and down that same oak tree, and no, not the longing to continue expanding his territory with a relaxing bathroom break, but rather the desire to be on the ocean, aboard a pirate ship? To, literally, be one of the most renowned 'scurvy dogs' in all the seven seas? Well, if you can recognize this look in your dog's eyes, then you should be the first to help him achieve his dreams (Dog may be man's best friend, but, remember, this friendship isn't supposed to be a one-way street!). Now, you don't need to go out and somehow get a ship for your little sea-dog, start off small and get this Red Skulls and Bones Bandana! By all means, if your dog is willing to wear a captains hat, go nab one of those for him too. 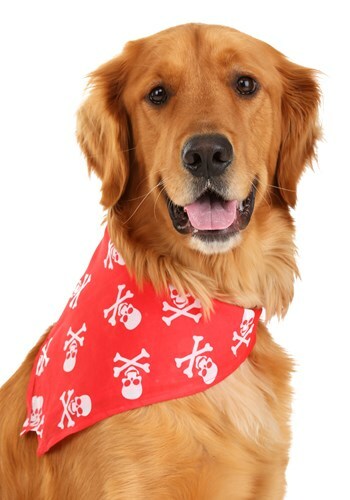 If not, then this bandana is the perfect apparel for your pup to get a paw in the door, and start off as a deck hand to any Pirate Captain. Maybe to even gradually work his way up to 1st Mate...maybe even Captain one day! The dog didn't eat it in 5 minutes.